You are obviously passionate about this subject. I love palaeontology too but only when the subjects are dead. Around where I live there are plenty of examples of primitive life forms. They do burnouts at night, spray incoherent rubbish on public property and crank up the base to stop themselves from thinking. Dear St. G, after spending some time in the Cango caves, as well as other South African caves, I discovered more than ample evidence of the FSM’s existence. The FSM also exists in other caves around the world, too (thank Cha-lok, Cha auk, and Te-Sok for that). If you’ve never been there, Oudtshoorn is a great place to ride one of the FSM’s noodly, but stupid appendages, and then to eat them afterwards. Ostriches are often referred to as ‘biltong’, which is one of those funny South African ways of saying ‘jerky’. I really wanted to sneak some biltong into Australia to introduce Orstraylians to his excellency, but those Orstraylian dogs stole it from me at the airport. By the way, bunny chow is the world’s most perfect food, next to pasta. Pasta. 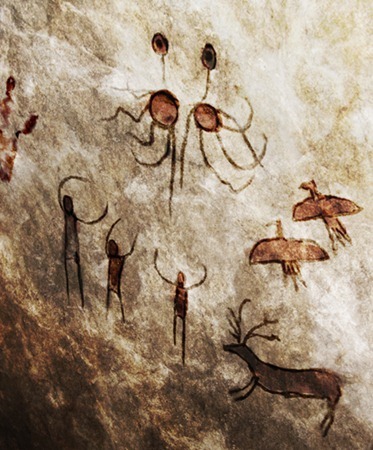 Dear Nate, this cave drawing predates Christianity. In fact, it predates the time when the world was supposed to have been created. Care to comment? I agree. It was created long before a creator or time even existed.